Jam Audio wireless speakers: Are these cheap speakers any good? | What Hi-Fi? Jam Audio wireless speakers: Are these cheap speakers any good? A sweet option or one to avoid? The market is awash with Bluetooth speakers, from portable budget models well under £100 to premium wireless speakers closer to £1000. The likes of Bang & Olufsen, Bose and JBL dominate the shelves and sales, and you probably have a good idea as to the pedigree of most of these mainstream brands, but what about those that aren’t quite as familiar? So should you buy a Jam speaker? Jam Audio is one name that could crop up quite regularly as you scour the best of the cheap wireless speaker deals. This consumer electronics brand has a wide range of portable products including Bluetooth speakers and wireless in- and over-ear headphones. Prices range from around £12 to around £60 so you’re talking budget and affordable. But are they any good? Our experience of Jam products over they years has been limited to a couple of Bluetooth speakers: the £20 Jam Classic 2.0 and the £70 Jam Heavy Metal HX-P920, both of which we reviewed in 2017. We didn’t find the Jam Classic to be the most captivating of performers, noting that if your aim was to boost the audio of your smartphone, “the JAM Classic 2.0 does enough. Just.” Three stars was our indifferent verdict. 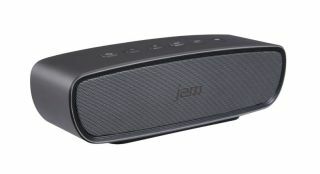 You can find the Jam Hang Up wireless speaker available with a 24% saving on Amazon already (down from £24.99 to £18.99). This dinky speaker comes in four different colours and is water and dust proof. Given its size, the Hang Up is probably best suited to occasional portable use, rather than making it your go to Bluetooth speaker. Although there might be some value if Jam's pricier speakers have a discount, we think you should probably investigate other deals available from rival brands before you commit. The likes of Ultimate Ears and JBL both have products that could rival Jam for audio quality and features at this end of the market. For inspiration, we’d suggest checking out our other wireless speaker reviews or consulting our list of the best Bluetooth speakers to help guide you. If you can find any of the products on this list with a decent saving, then you’re pretty much guaranteed a bargain.